In my early years of growing cabbage, I believed that the best cabbage varieties for my garden were fast-growing, disease-resistant hybrids. We all make mistakes, because although my fresh, organic cabbage was quite good, the flavor and texture varied little from cabbage I could buy at the store. Everything changed when I switched to heirloom cabbage varieties, some of which are so tender that they border on being buttery, with mellow spicy flavors that vary with the seasons. And they are all so different! First I tried sweet little ‘Early Copenhagen Market’, then space-saving ‘Early Jersey Wakefield’ and incredibly tasty ‘Golden Acre’. In every case there was a fascinating quality difference, which is one of the main reasons why we garden, isn’t it? In his book Heirloom Vegetable Gardening, writer and food historian William Woys Weaver devotes a lively chapter to cabbage, which he sorts into three groups: cabbage varieties with elongated or pointed heads (originally from the UK and Germany), round Copenhagen types from Denmark, and big Dutch drumheads. The elongated to pointed ‘Wakefield’ cabbage varieties were first selected in the Yorkshire region, and much further refined in America in ‘Early Jersey Wakefield’ (1868) and more heat-tolerant ‘Charleston Wakefield’ (1892). In the UK, ‘Early Durham’, ‘April’ and other varieties planted in autumn as spring cabbage fall into this group, too. All are edible at a young age, long before they form actual heads, but the best thing about these cabbage varieties is the way the upright heads shed rain, thus keeping their health in drenching weather. Mostly round in shape and unbelievably tender, ‘Early Copenhagen Market’ and ‘Golden Acre’ are the butterheads of the cabbage world, unsurpassed for raw salads or lightly braised summer dishes. These cabbage varieties are great fits for small gardens, because they grow well with close spacing. Majestic drumhead cabbage varieties are fun to grow from early summer to fall, so they mature around the time of the first fall frosts. ‘Late Flat Dutch’ is most common variety, but German-bred ‘Brunswick’ and frilly ‘Perfection Drumhead Savoy’ are garden show-stoppers as well. The spreading plants require plenty of space, but how many ten-pound cabbages do you really need? These are wonderful cabbage varieties for making into sauerkraut. “Need I remind my readers that with cabbages, soil is everything, and fertility is all the rest? Good cabbage land must be well manured,” writes Weaver, and of course he is right. Cabbage plants produce new leaves continuously, so they require a constant and balanced supply of nutrients. My personal method is to enrich roomy planting holes with two spadefuls of homemade compost mixed with a cup or so of an organic fertilizer made from poultry manure (poultry pellets would do as well). Soil that is regularly enriched with compost is supposed to provide sufficient amounts of boron, but I have seen slow-growing cabbage plants perk up overnight when showered with a little household borax (2 tablespoons of borax mixed into a 3 gallon watering can). This should be done no more than once a season, because too much borax is bad news for healthy soil. 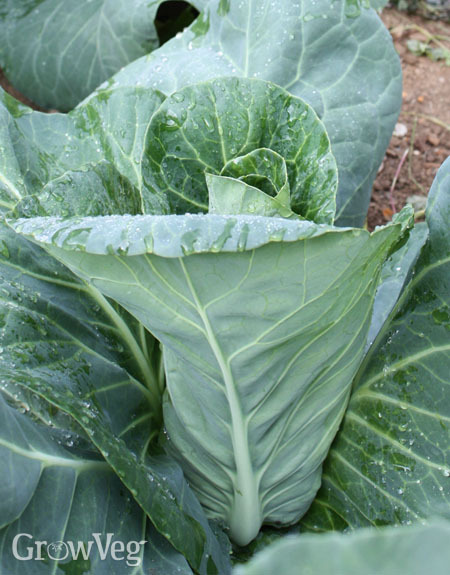 You also will need to protect plants from several types of leaf-eating cabbage worms. In spring, covering plants with row covers (garden fleece) helps warm the soil and buffers cold winds while keeping out insects, birds, and bunnies. Velvety green cabbageworms in particular love innocent young cabbage plants. When you see white butterflies flitting around your cabbage, you are watching the mothers of green cabbage worms laying their eggs. You can hand pick these common cabbage pests, but it is much easier to keep the butterflies from accessing your plants with row covers. Without row covers, you will need to treat plants from time to time with a Bacillus thuringiensis or spinosad-based organic pesticide. Big drumhead cabbage varieties and slow-growing reds require wide spacing, but you can interplant arugula, lettuce, or other fast-growing greens between the cabbage plants. You can also fill the space with small groups of onions grown from sets. Interplanting is often better than mulching early in the season, because slugs and earwigs can become a problem when provided with the irresistible combination of big cabbage leaves shading moist mulch. "Thanks for the helpful cabbage info! Do you start your cabbage from seed? If so, do you plant the seed outside in the garden, or start them under grow lights? " "Becky, I start my spring cabbage indoors under lights, starting in February, but in summer I start the seedlings outdoors in small pots and transplant them to the garden. Good luck! " "Amazing. The cabbage looks very delicious and healthy. Thanks for the information. " "Being a non gardener but a lover of buying spring cabbage I must point out my disappointment at the quality of spring cabbage I have been able to purchase these last few years the leaves being as tough as old leather as apposed to the tender buttery type leaves I remember and salivate for from the past any advice please?" "Years ago I served young collards to a British friend and she said, 'It's like spring cabbage!" One never sees such a thing in markets, and I think the produce industry has trouble with novel, seasonal vegetables. If you don't grow baby cabbage or collards yourself, farmers markets are the place to look for these treasures." "I have tried a number of different varieties of cabbage with good success with them heading and we like the flavor of most. The problem I have is the stalks growing so long they fall over and some have been ! 1/2' long. I tried doubling the lighting when growing from seed indoors and they looked good but when they hit the ground the stalks just grow. I found your article very interesting." "Ray, the only tidbit I know is that heat is associated with stem elongation in cabbage. I've seen this in the fall when I tried varieties that take a long time to mature."